Micro Greens Are In My Salad! Microgreens…what the heck is that? Well…it is just basically sprouts grown in dirt. 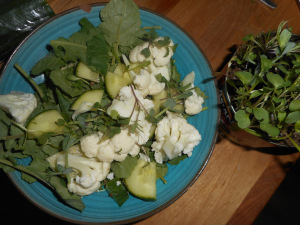 Today for my lunch salad I used some baby kale and the first of my micro greens which I started a couple weeks ago. As well as some burpless cucumber and cauliflower. I poured some homemade olive oil vinaigrette over it. It was awesome! This post is a revised version of one I posted last May. Being as it is still too cold to even plant my peas I am very glad for my microgreen crop which is growing in a tin can that once held bamboo shoots! Just poke a few holes in the bottom and you have the perfect shallow container to grow them.